London's weather is known for being quite unpredictable. In fact, Londoners regularly carry both sunglasses and an umbrella throughout the year. But London's weather is never so extreme as to detract from all the great things to do in the city. The hottest month of the year is normally August when the peak temperature can be 90 F (30 C) but the average temperature in August is about 70 F (22 C). The coldest month is usually January when temperatures can sink to around 33 F (1 C). Snow is pretty rare in London but if it does fall it's typically in January or February. Some rail services can be affected by adverse weather conditions. Don't forget to check with your transportation provider before traveling if snow is forecast. London is a year-round destination, so major attractions are not affected by seasonality. There's typically an increase in visitors in July and August so it's best to plan a trip at a different time of the year to avoid overcrowding. In general, London's weather is mild year-round, but just remember to pack a lightweight raincoat to keep in your daypack. The seasons change gradually and winter can appear to still be hanging on when it should be spring, but the weather is never so bad to stop you from planning to get out and about. There's so much to do in London, both indoors and outdoors that you'll never have to worry about the weather spoiling your plans. You'll always find something happening in this vibrant city! Spring in London is quite unpredictable, with weather that can range from warm (with temperatures into 70s) to chilly and damp days. Occasionally, there are even still frosts throughout spring. Luckily, by later in the season, the days are getting longer and it's apparent that summer is on its way. Not surprisingly, brief showers are common during London springtime—rainfall averages around 2.5 inches per month during spring. What to Pack: Given the variability of London's spring weather, you'll want to pack efficiently, with lots of layers and waterproof garments. A lightweight jacket and a down vest—both of which can be easily removed if you get too warm—are good ideas. London can have gloriously sunny summer days, but always weeks of continual rain. It's best to be prepared for both scenarios! If you end up with the former, consider yourself extremely lucky, as a sunny summer day in London is lovely. Like the spring, London sees around 2.5 inches of rainfall per month during summer, making it the driest season overall. Still, occasionally heavy downpours or thundershowers can occur in the afternoons. What to Pack: Be prepared for sun and rain, by packing layers like T-shirts, sweaters, and a pashmina or large scarf that you can put on or take off as necessary. Fall in London can bring good weather and nicer temperatures, especially in the earlier months. By October, however, temperatures drop and rainfall becomes more frequent. In November, frosts become common. 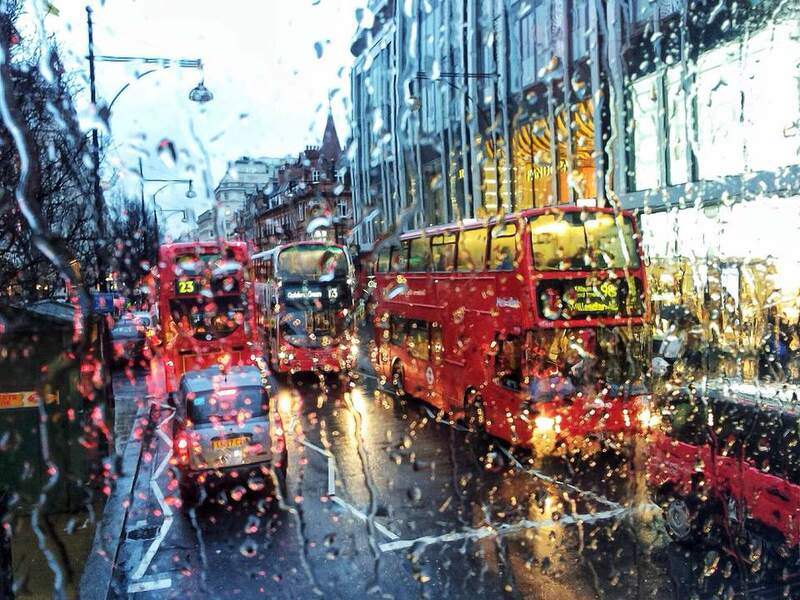 Late fall is the wettest time of the year in London, but it is not significantly wetter than any other season, so don't let it put a damper—pun intended—on your trip. Daylight also decreases quickly during fall. What to Pack: Fall can be warm, wet, cold, or some combination. Packing jeans, a sweater, and a vest is an almost foolproof combination that will see you through any weather that the city has in store. You'll still want to pack a T-shirt or two in case of a surprisingly warm day. Winters in London are cold, but not frigid like some of its neighbors. As climate change progresses, the season has grown increasingly milder with occasional spells of bizarre weather like increased snowfall, which is quite rare in the city thanks to its "heat island" phenomenon. Rainfall peaks during the winter, averaging around three inches per month. Unlike other times of the year, however, this rainfall typically occurs in drizzle or light showers which means you'll spend a lot of the winter season wet! London is also much darker during the winter, making the season a bit of a dull time to visit, except for the incredible Christmas decorations, which are among the best in the world. What to Pack: Like most cold winter climates, packing a warm coat, a cozy hat, and a scarf is a must. As a base layer, chunky knits will keep you warm. If you get lucky, you'll only need your heaviest coat on the city's coldest days.